For the second time this season, rookie John Hall took his Sovereign-Star Racing team to the semifinal round of a National Hot Rod Association (NHRA) national event. 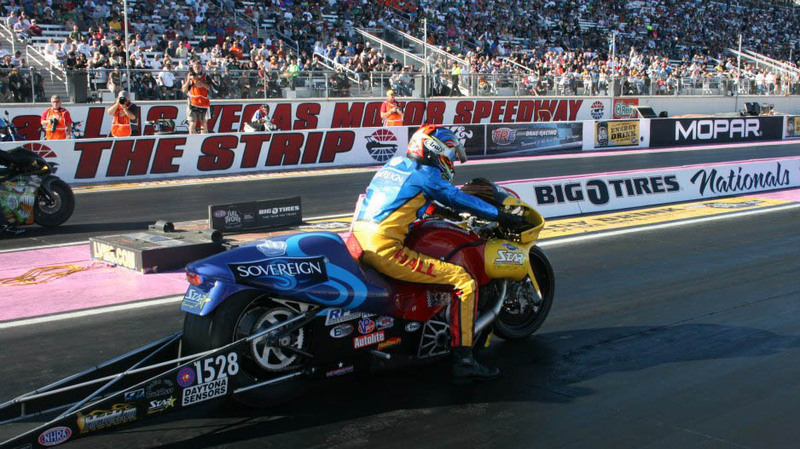 This past weekend’s race at the Big O Tires NHRA Nationals at The Strip in Las Vegas marked Hall’s and teammate Scotty Pollacheck’s 15th Pro Stock Motorcycle appearance at an NHRA national event since they began the season with the Sovereign-Star Racing team. With only one race left to go, these rookies have already set career and team records, made semifinal round appearances and were both nominated for the 2012 Automobile Club of Southern California Road to the Future Award given to rookies of the sport. Pollacheck is also currently in the Full Throttle Countdown to the Championship and has qualified at every race this season. Despite the rookies’ accomplishments and the support of their crew, Pollacheck and Hall are still concentrating on only one thing – racing. “Overall, we had a good, productive weekend in Vegas. I don’t like to get overconfident or put too much pressure on myself, though. I’m very happy that we went to the semis again, but we still have one more race to go. We want to shoot for the same results or better for the next race,” Hall said. As the No. 8 qualifier, Pollacheck faced Chip Ellis during first round eliminations Sunday and took the win with his 6.999/190 mph run against Ellis’ red light. “We ran well in the first round; we had a really good pass there. The sun was the warmest on Sunday, and the air wasn’t as good as it had been. So, to go a 6.99 in the first round was a pretty good run. We also tried some new stuff on the bikes that looks promising,” Pollacheck said. At the No. 12 spot, Hall was up against Michael Ray, who also redlit during round one, giving Hall the win with his 7.023/190 mph lap. 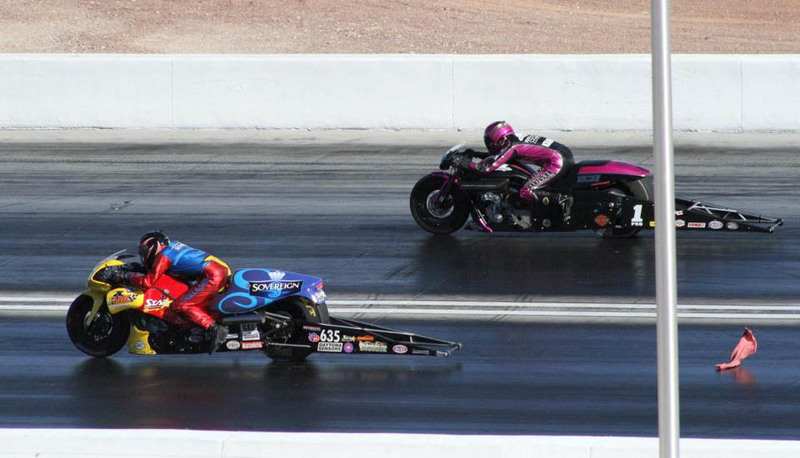 The Sovereign-Star Racing teammates advanced to face the Screamin’ Eagle/Vance & Hines Harley-Davidson duo in round two. Up against Eddie Krawiec, Pollacheck had a good light on him, but it wasn’t enough to hold off the Harley as Krawiec’s 6.961/194 mph lap took the win against Pollacheck’s 7.005/190 mph. “I left first and was going along, making a pretty good run. I didn’t see or hear him at first. Then, at about the 1000 foot or so he started creeping up on me,” Pollacheck said. Hall had better luck against the Harleys in round two, when he won the round with an excellent .006-second light to set up his 7.052/189 mph lap against Andrew Hines’ 7.082/190 mph run. This win marked the first for Hall against the four-valve, double overhead cam engines of the Harley-Davidson team after facing the duo in four prior races this year. The loss was a big blow to No. 2 Hines who has been competing with his teammate Krawiec for the Championship title. Luck ran out for Hall as he went into the semifinal round against Krawiec and left the line too soon, turning on the red light. Krawiec went on to win the event against Matt Smith in the final round. Following the weekend, Pollacheck dropped one place in the Countdown to the Championship as a result of Smith’s performance in Vegas. Hall’s semifinals appearance came during the same weekend that Hurricane Sandy made her way toward Hall’s home in Hamden, Conn. He was forced to remain in Nevada until the northeastern airports open back up and he can return to his home and family. The Sovereign-Star Racing team’s next NHRA national event will be in Pomona, Calif., Nov. 9-11 at the Automobile Club of Southern California NHRA Finals hosted by Auto Club Raceway at Pomona. The 2012 Sovereign-Star Racing Team is a partnership between Georgia-based Star Racing and the Hungarian-based Sovereign Racing Team, the 2011 UEM European Pro Stock Bike Championship Team, owned by sugar distributor Jeno Rujp. 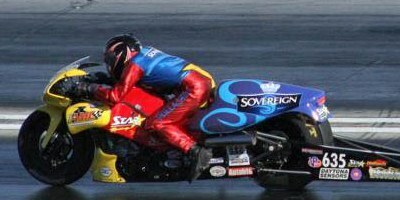 The Sovereign-Star Racing Team would like to thank the following sponsors: Sovereign, Star Racing, S&S Cycle, Daytona Sensors, Worldwide Bearings, CP Pistons, Permatex, Americus Motorsports Complex, Who’s Up Next?, and Quality Tire. Great job, John. Now come home.